To be fair, it wasn’t exacly a chore choosing goblinoids as my first Warhammer army. I started out with a few packs of hobgoblins, including two boxes of Despoiling Hobgoblins from the Regiments of Renown series, and kind of snowballed from there. This was shortly after Citadel Miniatures started issuing all of their figures with the appropriate slottabases, though it was still possible to get a lot of the old pre-slotta figures with cast-on bases, so half of my first army was neatly based on 20mm or 25mm square plastic bases, while the other half was crudely stomping around the battlefield with badly cut cardboard bases of roughly the correct size. Despite their basing issues, I was proud of my army. Okay, so only a handful of those figures ever came close to seeing a paintbrush, and it wasn’t long before they were all abandoned in favour of the much more glamorous wood elf army I would eventually nurture through the next fifteen years of wargaming fun, but those hobgoblins, orcs, goblins, black orcs, gnolls and ogres (okay, ogre, singular) were my first army, and I was going to conquer the world with them. As it transpired, I didn’t conquer the world. Even with me buying as many miniatures as I could afford I was still losing the tabletop arms race against my friends. They’d started from a position of strength and continued to build their armies just as quickly (if not more so in some cases) as I could, and it didn’t take me long to realise I’d never have as many figures as they had. And then along came Ravening Hordes, the second edition army lists that changed it all. For everyone else, Ravening Hordes represented a way of fielding balanced, fair armies against each other, but for me it represented the end of a dream. The Orc & Goblin army lists specified a minimum of thirty orcs (no problem, I had those), twenty-five goblin warriors (yep, same again) and an astounding fifty goblin archers. I had five. I needed to find another forty-five goblin archers from somewhere, at a time when money was scarce (I was like, fifteen years old and my dad had just been made redundant). A fully-fledged orc and goblin army was no longer for me. In fact, the release of that book almost put an end to my wargaming forever, as all of my friends and most of the other players I knew from the Games Workshop store became obsessed with the idea that every army fielded had to conform to the army lists, and I couldn’t meet the minimum requirements for any of them. Fortunately, I was able to scrape together enough cash to get started on my next army a few months later, and with those wood elves I was going to take over the world. Honest. 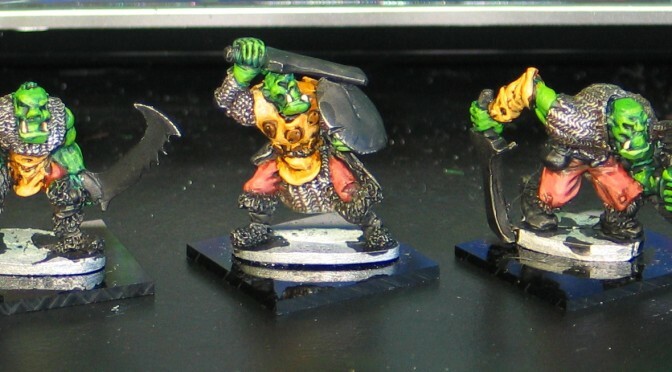 Anyway, all of the above is a roundabout way of saying that now I’m getting back into the whole Warhammer thing I’ve chosen orcs & goblins as my first army of this new era in honour of that army I had some thirty years ago. Only this time I won’t abandon them like I did the last lot. This time, they will take over the world.